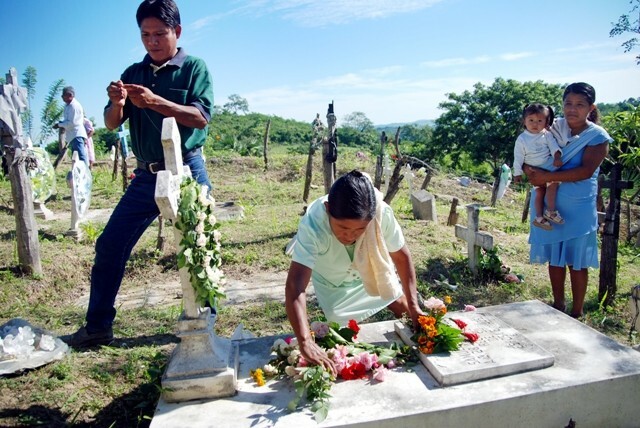 Family members prepare the grave site of their deceased love one in preparation for the Day of the Dead celebration. 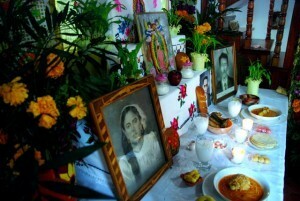 Offerings or Ofrendas are designed to have the favorite items of the deceased. Ok, OK, I know … those of us not from Mexico have the idea that skeletons are scary, graveyards at night are creepy, and human skull images are just found on the backs of leather motorcycle jackets & on sticks in the ground to deter trespassers from entering “forbidden” lands. And as for our deceased relatives, we may bring flowers to their grave sites to honor them but not food, alcohol, chocolate, lit candles, incense, or hire a band to play lively music as your whole family (yes, even the kids) hang out all night long waiting for the deceased to come. FYI – This celebration which happens to occur just after October 31st is not México’s version of Halloween. Yes, over the years, there has been some intermingling of the two. You may see small kids trick-o-treating but hey, why not … it’s more free candy for them! Yes, people (and kids) might get dressed up in costumes but not usually as Batman, cute pumpkins, a can of Spam, or even Casper the Friendly Ghost. The most common costume is to dress up as a skeleton especially with an awesome elaborate facial makeover. It is just a traditional fun way to portray the dead mimicking the living. So is the Day of the Dead a creepy event? This is a joyous celebration, a reunion where for a few nights each year, Mexican family’s living relatives and their spirit relatives create the opportunity to gather together again. Respect, honor, and remembrance of the deceased family member or friend are their reasons for the centuries old tradition known as Día de los Muertos. Drinking, dancing in the streets, music, impromptu parades, colorful costumes, decorative masks, and even fireworks are activities found during the multi-day Day of the Dead festivals held throughout much of México. One of the more prominent regions to witness this hugely popular spectacle celebration is found in southern México, in the city of Oaxaca and the surrounding small towns. They do it up BIG in the state of Oaxaca with their lively parades, candle-lit cemeteries, music, and traditional markets chocked full of arts, crafts, food, and lots of items relating to Día de los Muertos. Other reasons for visiting this area are to explore the beautiful colonial city of Oaxaca, see the many local artisans who work in clay, wood, and other mediums, explore interesting ancient archaeological sites, and enjoy a variety of outdoor adventures found nearby.
. 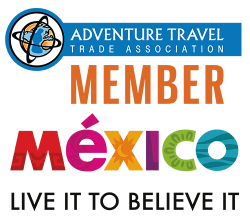 The itinerary of this trip combines a mix of witnessing up-close Oaxaca’s Day of the Dead festivities, learning about the local culture & history, and participating in some exciting outdoor adventures. Space is still available. 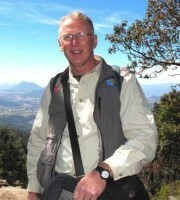 For the complete itinerary and trip pricing, click here.